The National Convention of the Lutheran Ministerium and Synod–USA held at Christ Lutheran Church of Chetek, Wisconsin June 22nd-24th was a Mystical Point in Time. The Luther Rose at Night at Christ Lutheran Church of Chetek, Wisconsin. It was a glance back at recent American Lutheran history: first, a snapshot look at the inauguration of the American Association of Lutheran Churches (AALC) 25 years ago in Minneapolis, historically the predecessor body to the LMS-USA; second, a nostalgic nod to the launching of the LMS-USA itself in Indianapolis, Indiana 17 years ago in 1995. Dr. Donald Thorson, Pastor Ralph Spears, Pastor Mark Dankof, Pastor John Erickson: 25 years later. June 2012 in Chetek, Wisconsin. This year’s National Gathering in northern Wisconsin reunited 4 men tied to the earliest history of both Lutheran bodies and all now members in good standing of the Clergy Roster of the LMS-USA in 2012. Dr. Donald Thorson of Chippewa Falls, a member of the Executive Committee of the American Association of Lutheran Churches (AALC) a quarter of a century ago, joined the LMS-USA formally in the moving closing service held at Christ Lutheran of Chetek on Sunday, June 24th; Dr./Pastor Ralph Spears the Presiding Pastor of the Synodical side of the LMS-USA and Pastor of St. Matthew Lutheran of Indianapolis, spoke at the Convention’s opening worship service on June 23rd; Pastor Mark Dankof of Immanuel Lutheran of San Antonio and a member of the LMS-USA since its inception in 1995, was acknowledged as the first Lutheran clergyman to join the AALC officially on July 10, 1987; Pastor Emeritus John Erickson of Christ Lutheran of Chetek, the Presiding Pastor of the Ministerium, rounded out the lineup of AALC veterans who have graced the senior leadership of the LMS-USA since the heady days of Indianapolis in 1995. Pastor Spears emphasized the Living Stone as the center of the story of Christian redemption, reconciliation, and eternal life. The Lively Stones are entrusted with continuing to “Tell the Story,” of the Living Stone, the theme of the LMS-USA National Convention, with absolute fidelity to the inspired, inerrant Word of God of Scripture which conveys Christ Crucified and Christ Risen as the Christ of Scripture, the Christ of History, and the Christ of Faith. Dr. Spears’ homily set the tone and the stage for the major speakers and presenters assigned to provide instruction and ministry to those gathered at Christ Lutheran for the weekend. There were seven (7) special presentations which followed, and which covered a wealth and breadth of material for those who traveled to northern Wisconsin from around the country to hear them. Each presentation was compelling. In his tome on Liturgy, Dr. Spears insisted that, “Liturgy ties together the theology and practice of a Church and acts as a barometer of its very function.” In that regard, the longtime Pastor of St. Matthew’s Lutheran in Indianapolis shared his historical and functional perspective on worship, postulating that, “Most liturgy can be traced to the all-important need to remember, especially in the context of a verbal tradition before the days of written history.” Liturgy in this regard involves the remembrance of key events in the life of a people in linear history, where the prose of scribes enables the people to “. . . memorize the events, rehearsing and singing the prose from memory from time immemorial.” Eventually, Dr. Spears reminded the Convention attendees, these pieces of prose were written down by later generations, as evidenced by the Song of Deborah and the Great Passover Liturgy. The Collect for the Second Sunday of Lent, titled “Reminisce,” is suggestive. God commanded His people to remember–and they did. Dr. Spears proceeded to remind his hearers that if Liturgy includes committing a proven history to memory, it must also “. . . be careful with the words and phrases concerning God–and use them with great respect.” Liturgy must avoid the “God and I are buddies” approach in which “we prevail upon Him with a certain insider attitude“, where intimacy on God’s terms is replaced by one solely on ours. A misplaced sense of intimacy, a false sense of “ordering the Almighty around” and embracing the trivial to make it more approachable, are to be avoided. Calling upon the Name of the Lord is to be accompanied by absolute respect and care. The attitude of the Pastor in leading the Liturgy must be saturated in the latter, with balance rooted in Biblical and historical persective assisting in the avoidance of both manipulation and trivialization of the Divine and the Holy. Pastor Emeritus John Erickson of Christ Lutheran Church, Chetek, Wisconsin. 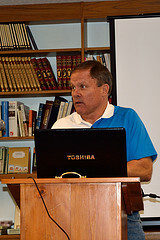 Pastor John Erickson’s review of his October 1993 message in Janesville, Wisconsin, entitled “A Problem of Identity,” brought 25 years of AALC and LMS-USA history into play in reviewing his own observations on an identity crisis in American Lutheran theology and worship previously evidenced in the Spears lecture on Liturgy. With references to changes in the AALC between its constituting National Convention in November of 1987 in Minneapolis, and an “infamous” National Convention only 3 years later at Northwestern College in St. Paul, Minnesota, Pastor Erickson chronicled the erosion of Lutheran theology and practice in that situation, courtesy of the trends of much of contemporary American Evangelicalism, including the Charismatic Movement, the Health-Wealth Prosperity Gospel, the reduction in doctrinally sound preaching, the embrace of Dispensationalism and Premillennial Eschatology, the replacement of the Lutheran Chancel (altar, font, and pulpit area) as the focus of worship with the “Stage” of Evangelical Performers and Entertainers, who often substitute “success” and “numbers” for doctrinal and devotional integrity informed by the history of Liturgy and the orthodox Lutheran understanding of this history. Pastor Mark Dankof of San Antonio followed with “The Famine, The Watchman, and the Remnant.” It was noted that Pastor Dankof was literally the first Lutheran clergyman in history to be accepted onto the clergy roster of the American Association of Lutheran Churches on July 10, 1987. 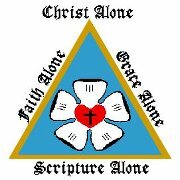 His congregation, St. Matthias Lutheran of Seattle, was one of the Charter Churches entered into membership on the AALC’s Congregational Roster at the constituting National Convention in Minneapolis in 1987. Pastor Dankof was subsequently elected to the AALC’s Board of Trustees and its Board of Higher Education in those pivotal days. Yet within 3 years, he and his congregation were gone. Why? His presentation dealt with the reasons for the departure, based on the trends in the AALC cited by Pastor Erickson in 1993 and again in 2012. With reference to Amos 8, Habakkuk, Revelation 2: 9, and Daniel’s 70 Week Prophecy in Daniel 9, Pastor Dankof suggested that both the United States generally and most of American Lutheranism specifically, are being impacted by a Famine of God’s Word as Ancient Israel was at the time of Jeroboam II and the prophecies of Amos. To be a Watchman at such a time in history references the hardships of Habbakuk and others playing this role now for God’s people in difficult and dark days. The Confessing Church of Christ is a Remnant Gathering of the Faithful in the midst of such darkness, with reference to the Church of Smyrna in John’s Apocalpyse as the model (Revelation 2:9). Madison’s Arik and Tina Johnson of Altum Radix (“Deep Roots”), a food and Gospel ministry based on the Parable of the Sower. Pastor Tylan Dalrymple of Christ Lutheran Church, Chetek, Wisconsin. Arik Johnson of Aurora Competitive Intelligence, the Green Bay Packers, and a special home farm south of Madison designed eventually to feed the poor of the inner city in the name of Jesus Christ. Arik and Tina Johnson of Madison told the LMS-USA National Convention of their farming acreage south of Wisconsin’s Capitol, designed to be used to facilitate food production to feed the needy of the inner city in the name of Jesus Christ, according to the focus of the Parable of the Sower. The name of the food and Gospel proclamation ministry, based on the New Testament parable, is Altum Radix (“Deep Roots“). Arik has been the longtime Internet web site director of the LMS-USA gratis in perpetuity, and recently began the Facebook page for this Remnant gathering of the Lutheran faithful. Finally, Pastor Jeffrey Iverson rounded out the Convention seminars with his “Finding the LMS-USA.” Pastor Iverson referenced all of the circumstances that led to his encounter with the Synod’s leadership in the 1990s; his personal journey in his calling prior to that time; his ordination service of June 8th, 1997 at St. Matthew’s Lutheran Church in Indianapolis, presided over by Dr. Spears and where Pastor Mark Dankof offered the special day’s homily; and finally with references to many trials and tribulations since, trials seemingly typical for the Christian in an increasingly post-Christian American society and secularized church. The Crucified Son of God, Jesus Christ.